Facilitated by technically advanced process, we are counted as the topmost manufacturer and supplier of a distinct range of Multiple Applications Gas Panels. Our offered gas panels are manufactured using premium quality raw material and advanced technology in adherence with industry norms. The provided gas panels are used in research laboratories, process analyzers and laser gas systems. Furthermore, our provided gas panels are available in varied specifications. 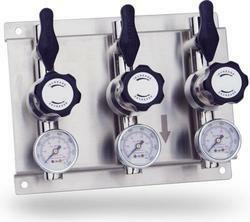 Looking for Gas Panels For Multiple Appliacations ?